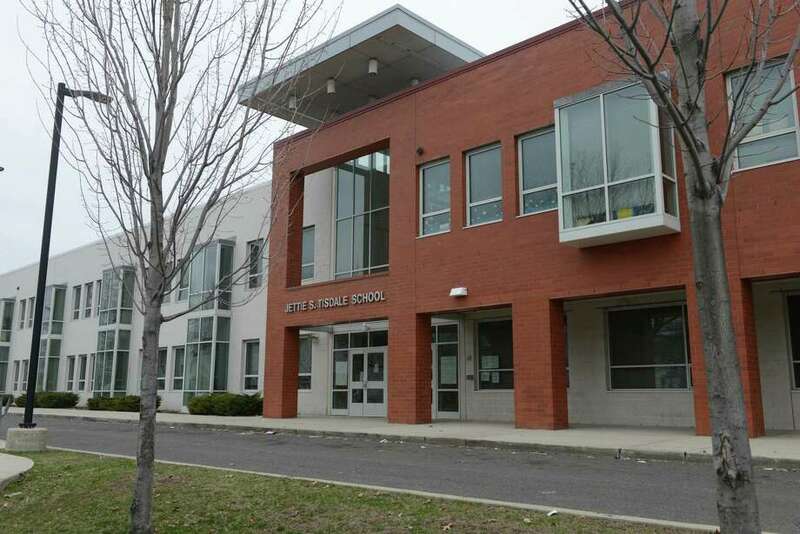 FILE PHOTO — Jettie S. Tisdale School in Bridgeport, Conn.
BRIDGEPORT — A student at Jettie S. Tisdale School found two bullets in the school’s gymnasium on Tuesday, police spokesman Terron Jones said. Jettie S. Tisdale School, at 250 Hollister Ave., teaches students from kindergarten through eighth grade. The staff member told the security staff and then the police were called in around 11:30 a.m.
“The school was put in lock-in/lock-out,” Jones said. A lock in/lock out means classes continued as planned, but students and staff were kept out of the gym as police investigated and no one was allowed to enter or leave the school. Jones said the police officers did a sweep of the school and the lock in/lock out was lifted within 20 to 25 minutes. It was unclear how the bullets ended up in the school. Jones said there were no guns were found. Earlier this year, a gun was found in a student’s backpack at Blackham School, which serves students from pre-kindergarten through eighth grade. On Jan. 26, Blackham School security was alerted that a student might have a weapon in a backpack. Minutes later, the weapon was found and confiscated. Police said at the time that the gun was a 9mm Beretta 92. Unlike Bridgeport’s high schools, Blackham and Tisdale do not have metal detectors.